Well, it's true. The kitchen chairs were a failure. I wrote here about my goals for January. The stairs were the big project and my kitchen chairs were supposed to be a smaller easier to accomplish one. Famous last words, right? They looked like this at the beginning of the month. The towel was hiding some gross stains. They look like that still today but now the towel is covering the foam seat instead. I knew exactly what I wanted to do to them. I had a graphic picked out and a tutorial on how to get it onto fabric all ready for me. It involved printing onto freezer paper then ironing onto my fabric then burnishing with the back of a spoon. It didn't work. I don't know if it was my fabric that just didn't want to have a graphic on it or what ;) It was just way too faded. So I turned over my fabric and tried painting on it to look like a grain sack. That went fine but looked stupid with the architecture of my chair. All those slats going up and down on the back of the chair and then more lines coming down the middle of the seat, yuck. So I went to the fabric store looking for a printed fabric to put on the chairs. Nothing. Then I searched and searched for another tutorial about getting a graphic onto fabric. 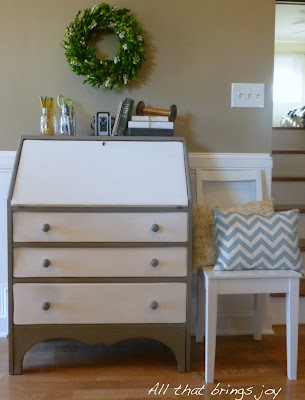 I found one that involved printing onto freezer paper then burnishing onto dampened fabric. It actually worked. But I no longer really wanted a graphic on the chairs, go figure. 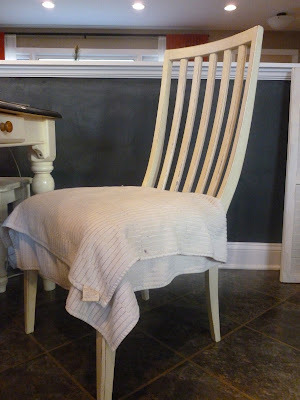 After searching for inspiration to make a slipcover to go over the seats that could come on and off and had pleats and tied in the back I decided I'M DONE. I'm officially uninspired with this project. I will go back to it at some point when it feels exciting again, THE END! Okay, the stairs are finished for real this time. I guess I should have waited for their reveal but I didn't expect to be done with their finishing touch so quickly! 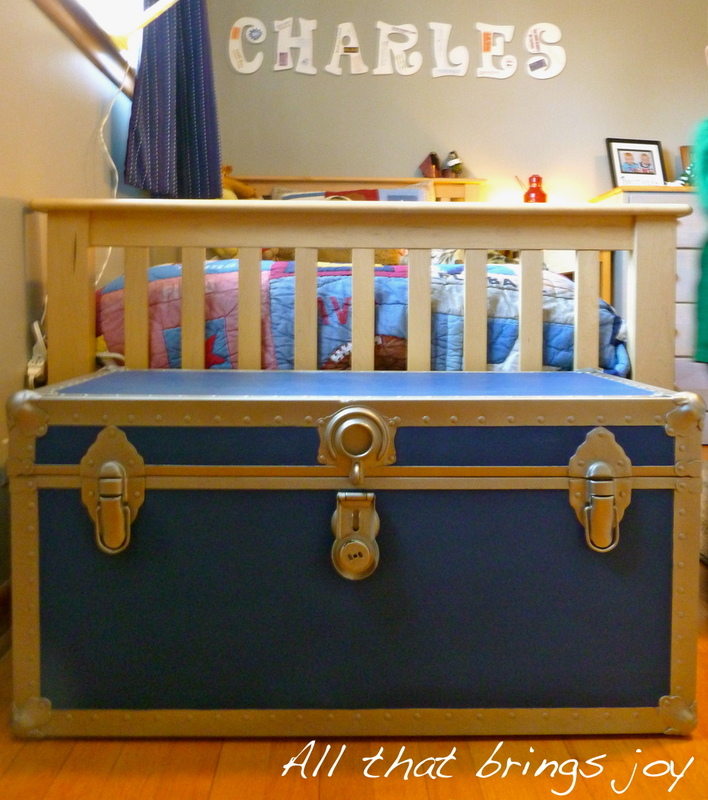 It turned out to be a very quick and easy project. Like I said, it was so quick and easy to add those numbers, I'll show you how I did it. I started by finding a font that I liked, this one is called Pharmacy and you can download it for free here. I scribbled over the entire number on the back of the piece of paper. Then I flipped over the paper and taped it to my stair. 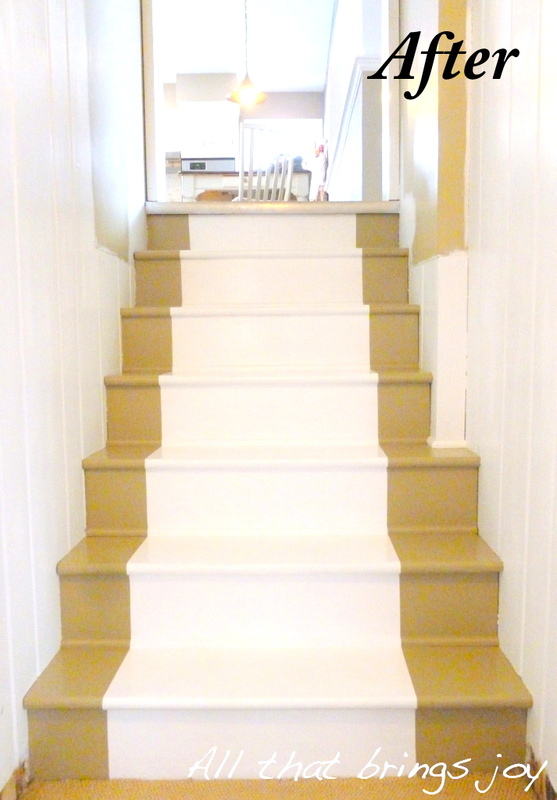 I measured the middle of the white area on my stair and then guesstimated the middle of the number. They all lined up just fine in the end. 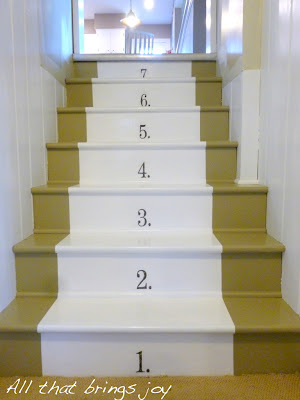 It was important that all the numbers were cut out the same size so that I could just tape them up against the bottom of the stair and they would all be the same distance from the bottom of the stair. 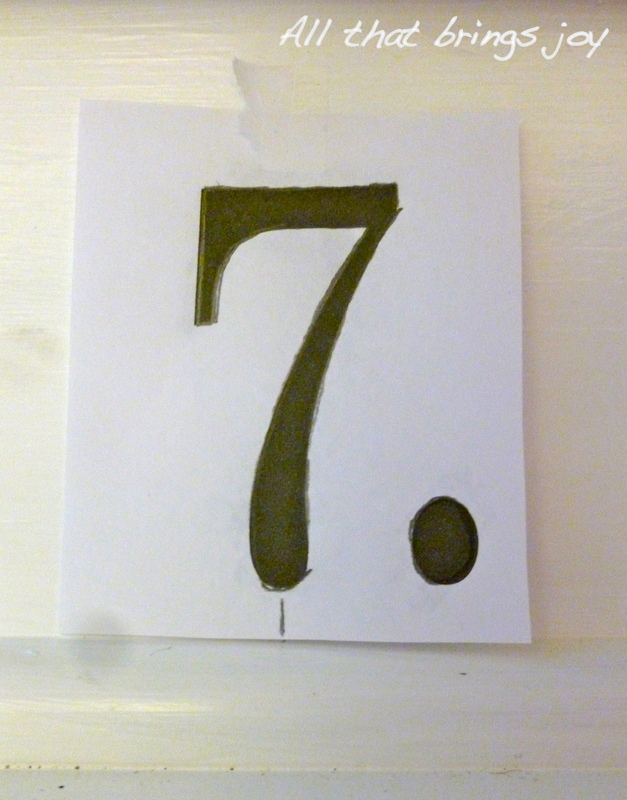 Then I traced around the number and it left a perfect pencil mark on the stair behind. I just filled that in with a tiny little paint brush and some black paint. And there you have it! It only took me a couple of hours total including resting time so my hand didn't cramp up. Also I found the paint color for the sides of the stairs!! It's called Nutshell by Martha Stewart. I had it color matched in Behr paint though, I just prefer using that brand. 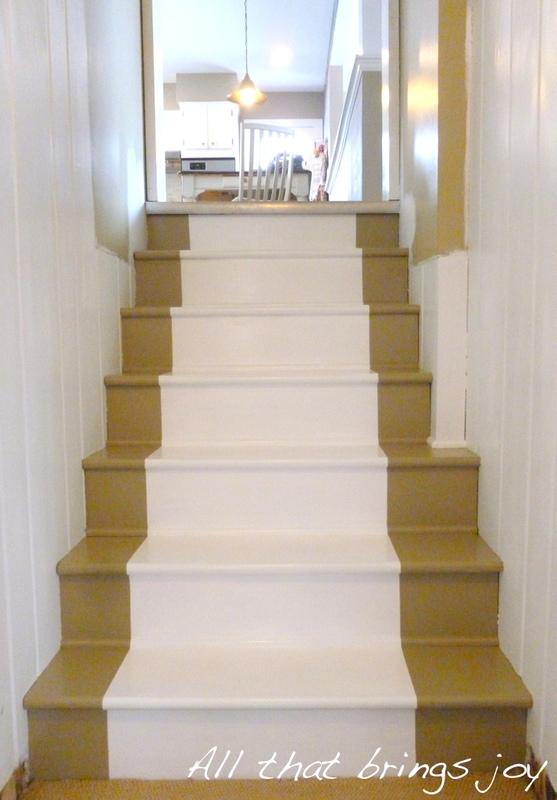 It was 2 years in the making but my basement stairs are finally painted! Ahhhh, yes. Isn't that beautiful....shudder. 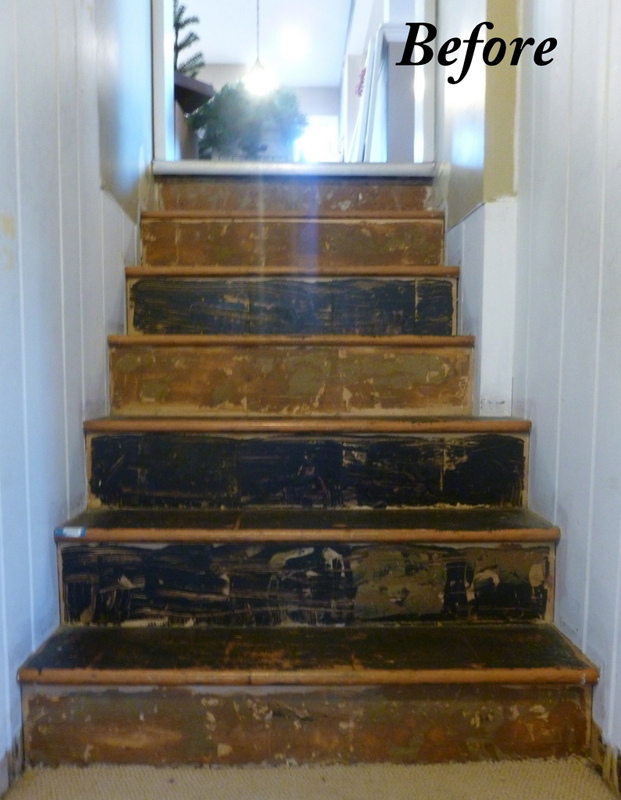 As I mentioned when I posted about my goals for this month, these stairs were carpeted when we moved in. I feel like carpeted stairs always look dingy and dirty and cleaning my carpets is not one of my strong points so we ripped out the carpet and found linoleum tiles underneath. 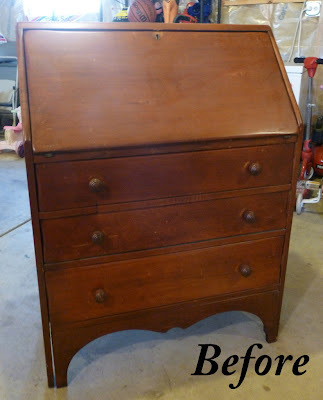 We pried that out and were left with thick, grooved glue on the wood. We thought we could sand it off but the glue just kept heating up and getting sticky. So on to plan B, flipping over the treads. No legs were broken thank goodness. 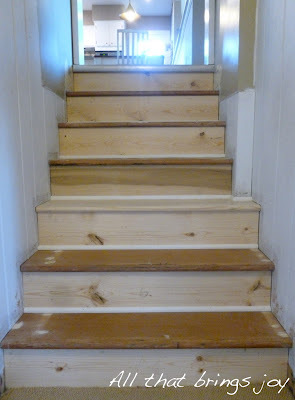 We had to replace the risers but it only required a couple of 1x8 pine boards which cost $12 in all. After installing those with a nail gun Scott took the old treads out to the garage and repaired the ones that got damaged. There was a lot of wood glue and wood putty used but we were able to use all but one of them in the end! It turns out these walls are crooked, so when the builders put in the stairs (in 1950) they cut them crooked to fit. This is all well and fine except that when you flip over the tread it is now crooked in the WRONG DIRECTION. Therefore there were unsightly gaps, some bigger than others. To hide this problem a bit we installed some quarter round. Now I could finally start painting. I primed 3 times then painted with Ultra Pure White in semi-gloss from Behr down the middle of the stairs 3 times. I should mention that while priming I would do every other stair so that I could still get up and down the stairs! 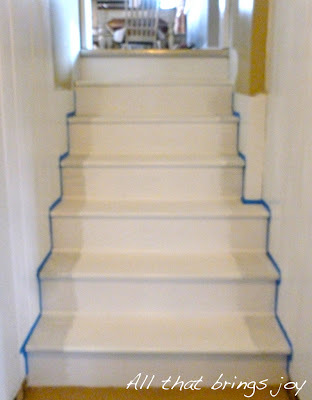 Once I had marked the line all the way up the stairs I taped along it and painted the edge with some more white paint to help prevent bleeding. Then I just painted in my accent color....oh poo. 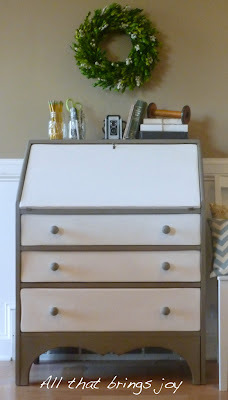 It was a Martha Stewart color that I had color matched in Behr paint but I can't find the swatch right now to give you the name! **UPDATE** The color is called Nutshell. Just two coats and then I removed my tape. It bled through only in some of the corners where the tape was gapped. I'm so happy that this project is finally done! Shall we look at a before and after one more time?? Here are the stairs now that I added some hand painted numbers! You can see the tutorial here. After letting the kids draw on and have there fun with the chalkboard wall in my kitchen for a few weeks I decided it was time to do something useful with it for awhile. 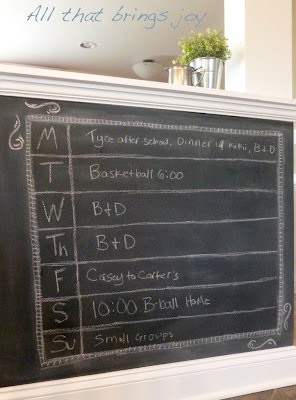 My husband suggested a weekly organizer to help with the chaos and I agreed right away. I have my calendar on my computer but it helps to see certain things written down on the wall as a reminder, not to mention Scott never looks at my computer calendar, ever. I don't claim to be any kind of chalkboard artist that's for sure. I had to rewrite a few things because Casey said he couldn't even read it. sigh. It's partly the chalk, do people use those chalk pencils on there walls or am I just that bad?? Oh well, I like it :) And I'm getting a little better. 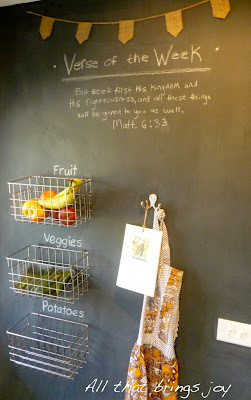 At small groups a few weeks ago we talked about memorizing Bible verses and I was embarrassed to say that after years of Bible memory work at school I felt a little bitter about it. I was never good at it and it always just felt like something I did because my Bible class grade depended on it. Well I know now that it's not something you do because you have to but because you want to. I want to memorize God's words and have them written on my heart and brain, there to comfort me when I need them most. So to help me I reserved a spot on the wall. 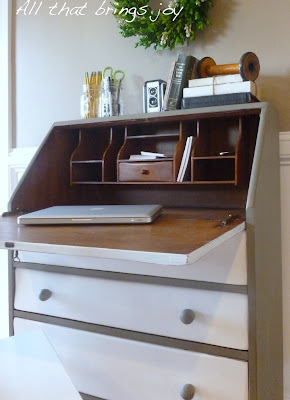 I've been excited about sharing my grandma's secretary for awhile now. I finished it weeks ago but never had time to get it upstairs for pictures. Not to mention the lack of sun. I'm saving up for a dslr camera which will help with that problem a little. But it's going to take me months. Anyways, I think I managed to get a few good shots of it :) This piece is going to my younger sister's house so she made the decisions on color and everything. 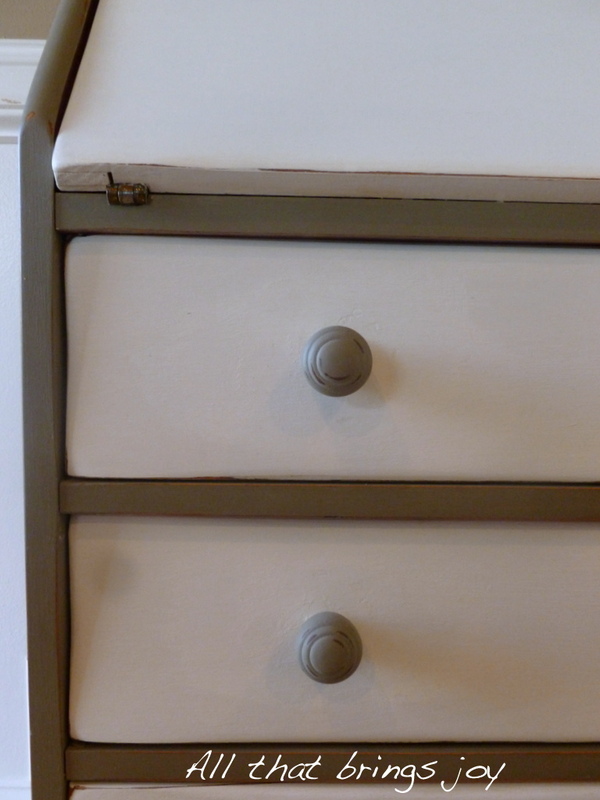 She decided to go with a mix of cocoa and graphite Chalk Paint for the body and pure white for the drawers. I didn't give her a choice on the inside of the desk though....I wasn't about to try to paint the insides of all those cubbies!!! ;) But seriously, I thought the natural wood looked beautiful next to the colors we used. I'll give you the answer right now. A big, fat, resounding NOPE!! Last January I wrote a post with all of my goals for my home in 2012. (You can see it here) Looking back now I'm pretty sure I knew there was no way I had the time or budget to finish all of those rooms. The only room that looks any different is Casey's bedroom. Last February Scott made him the loft bed we had promised him. It took me months before I finally got it primed and then nothing. I never painted it, put up the curtain that is going to be underneath, finished the bedding, or put up lights by his head and underneath for reading. This would be why I never shared it here! So as I thought about writing another post about my goals for 2013 I realized that they're the exact same. And I once again feel that it's unrealistic time and budget wise to think I can finish all of these rooms. So I have a new plan. Here are my goals for the month of January. Nothing too big, but 2 things around my house that need to get done!! First up, reupholster my kitchen chairs. I did a post about them here. But since then they have become very badly stained, not just by food, but a year of potty training...yuck, I know...so they have towels on them to hide it from guests. Secondly, fix up our basement stairs. These stairs go down to our basement but we live in a split level home so the basement is one of our most used rooms. 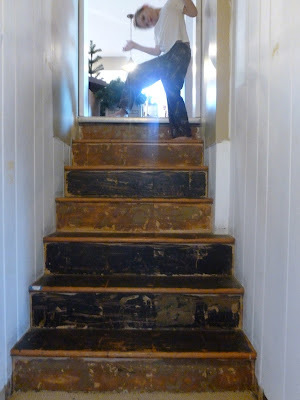 Almost 2 years ago I told Scott I wanted to rip off the carpet and paint the hardwood stairs. He loved the idea and immediately ripped off the carpet for me. 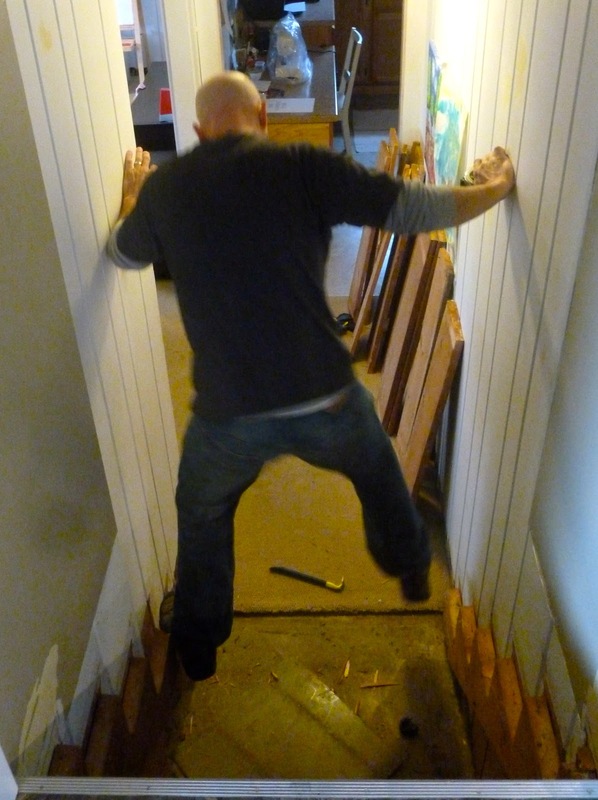 Then he had to pry off the linoleum tile underneath. There is so much glue on the wood that he tried to pry up a couple of steps and flip them over but the wood started splitting and cracking so he stopped. 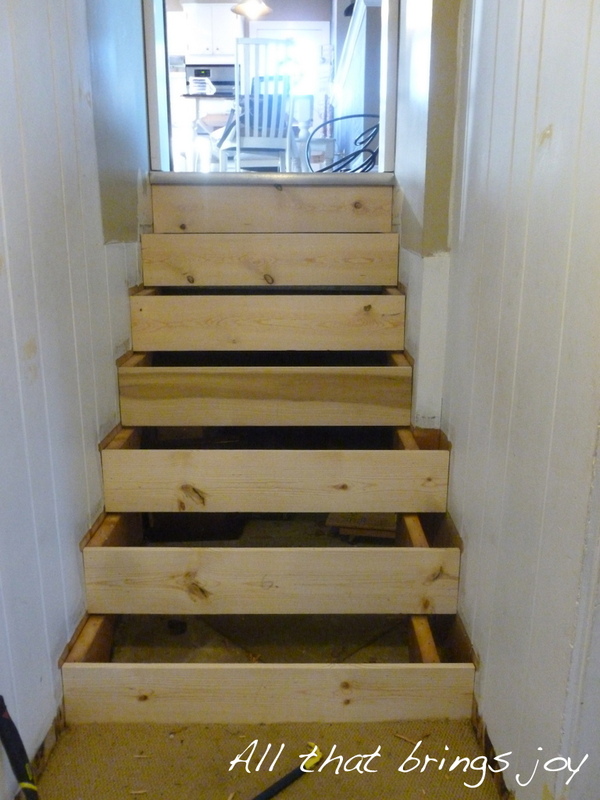 Now the first 2 stairs aren't even nailed down and this is what it looks like. Bare feet on the stairs?? Be careful for splinters, Casey!!! 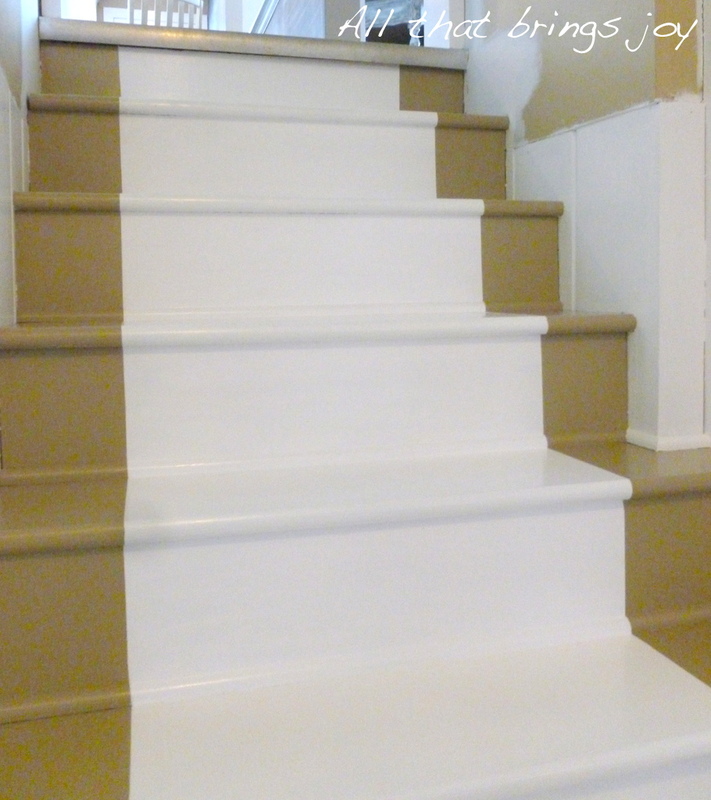 I still don't want to buy all new risers for this staircase just to paint them so I might give my palm sander another try or borrow a belt sander from someone. So that's it!! Just two goals and 24 days left in the month to do them. Fingers crossed!!! One of my neighbors came knocking on my door last month asking me if I had time to do a project for her. Her dad was about to get rid of an old brass chest/trunk that he had had for years but she rescued it in time. The fact that it was shiny brass had me a little nervous but we both felt it was worth a shot. I decided to start by spraying the whole thing with a primer spray paint. And I realized part way through that I hadn't taken a before picture. I sprayed the whole thing with a couple of coats of primer and then went over all of the edges and hardware with some Rustoleum spray paint in Brushed Nickel. Then came the tricky part. 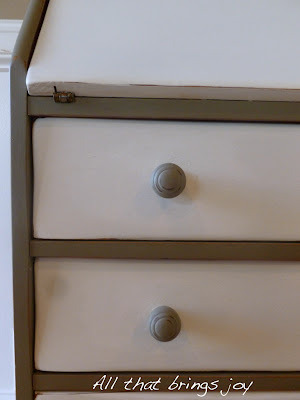 I painted the body of the chest with some Napoleonic Blue Chalk Paint. 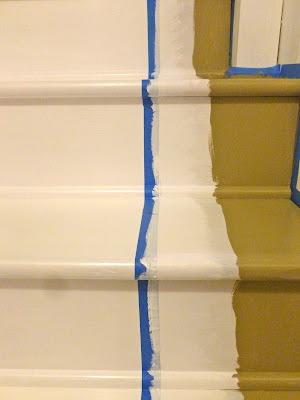 There were lots of tiny areas to get my paint brush into and I didn't think painters tape would be much help so I just used a tiny paint brush from Hobby Lobby and a very steady hand. After a few coats and a little drying time I waxed the whole thing with clear wax. Done! 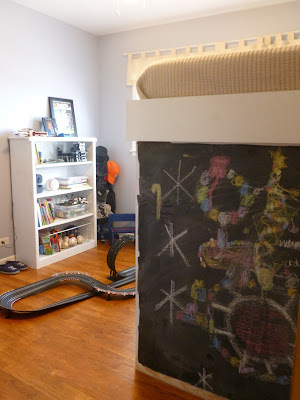 It is in her twin boys' bedroom so I will have to ask her soon how the paint job is holding up. 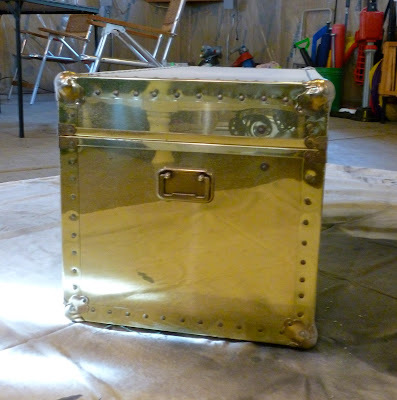 I knew right away that I could paint over the brass but my concern is wether or not it will chip easily. Only time will tell! In the meantime it looks so cute in their room!